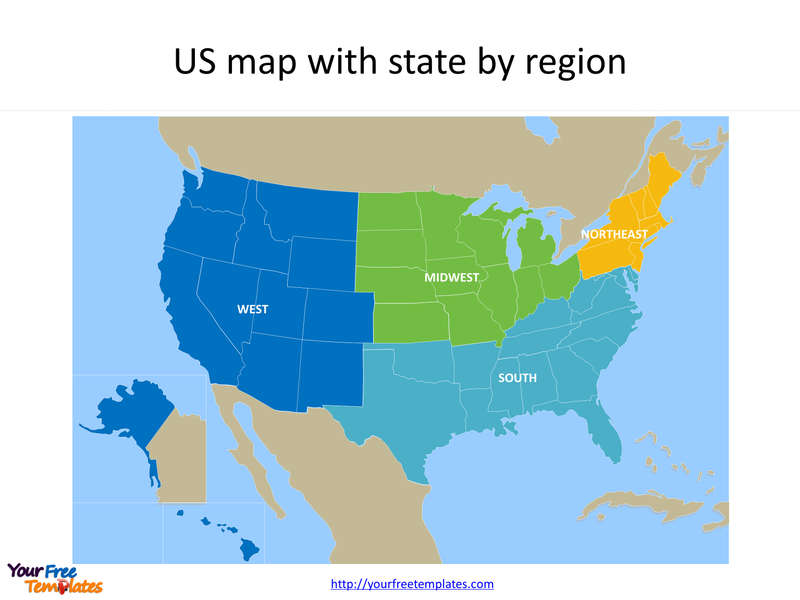 The US map with states Template in PowerPoint format includes two slides. Firstly you have the blank and framed US map with states. Secondly US map with state names have the two-letter abbreviation state names. 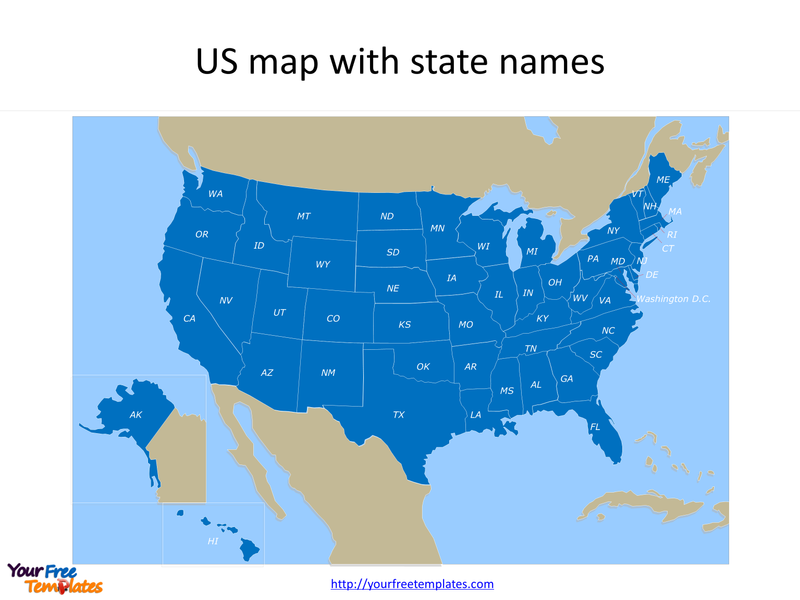 Finally the framed US state map by region will let you add country names or ocean names to customize your own USA maps. 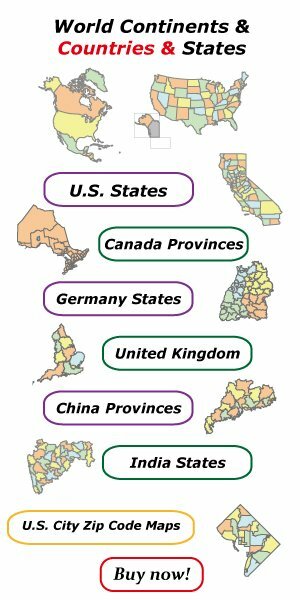 The US map with states PowerPoint Template includes two slides. Slide 1, blank and framed US map with states. The United States of America (USA), commonly known as the United States (U.S.) or America is the federal republic composed of 50 states, a federal district, five major self-governing territories, and various possessions. For one thing, the capital is Washington, D.C., and the largest city by population is New York City. Then the Forty-eight states and the capital’s federal district are contiguous in North America between Canada and Mexico. Furthermore the State of Alaska is in the northwest corner of North America, bordered by Canada to the east and across the Bering Strait from Russia to the west. Finally the State of Hawaii is an archipelago in the mid-Pacific Ocean. The blank and framed US map with states is an ideal PowerPoint template for your documents. USA is a country composed of 50 states. They are Alabama, Alaska, Arizona, Arkansas, California, Colorado, Connecticut, Delaware, Florida, Georgia, Hawaii, Idaho, Illinois, Indiana, Iowa, Kansas, Kentucky, Louisiana, Maine, Maryland, Massachusetts, Michigan, Minnesota, Mississippi, Missouri, Montana, Nebraska, Nevada, New Hampshire, New Jersey, New Mexico, New York, North Carolina, North Dakota, Ohio, Oklahoma, Oregon, Pennsylvania, Rhode Island, South Carolina, South Dakota, Tennessee, Texas, Utah, Vermont, Virginia, Washington, West Virginia, Wisconsin, and Wyoming. Every individual political subdivision is an editable shape. Detailed US map with state names of political administrative divisions please refer to Wikipedia USA. The regions are Northeast, Midwest, South, and West. US state map by region is for states grouped by census regions. Division 8: Mountain (Arizona, Colorado, Idaho, Montana, Nevada, New Mexico, Utah, and Wyoming). Division 9: Pacific (Alaska, California, Hawaii, Oregon, and Washington). Puerto Rico and other US territories are not part of any census region or census division.